Please Note: Any legal information provided is for informational purposes only. Our specialty is party rentals, not law interpretation. Please consult counsel for personalized legal advice. Also please remember: Donation amount can be suggested to guests but it is illegal to require donations from guests to play game of chance. LAY OUT YOUR BEST SUIT! There is no sales pitch here, this is a simple issue: There are many people out there who are in need. Furthermore, charities set-up to help those folks are in need themselves! We bring human beings together to turn that fundraiser into a FUN raiser! An Amerifun casino party is a Fundraising Humdinger. Discounted Rates available for your 501c3 charity. Highest Revenue Potential as compared to other fundraising providers. If you are considering a casino night for your fundraising project look to Amerifun for fanciful equipment, exclusive benefits and over a decade of expertise. Please feel free to use this informative page as an added resource to help initially stage your fundraising casino event. 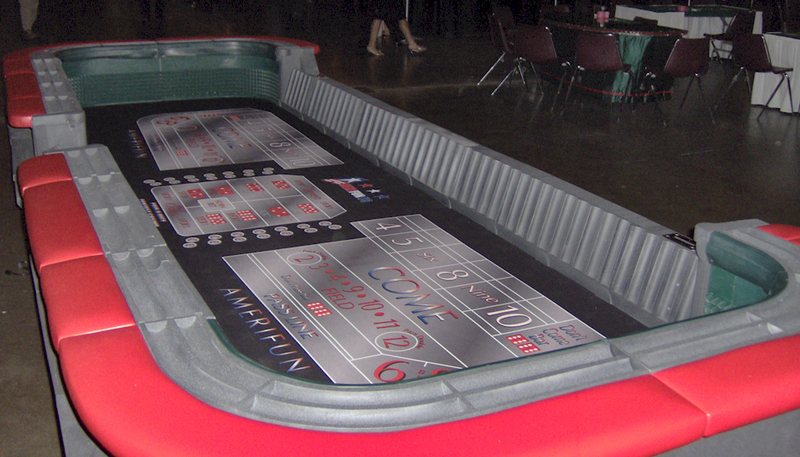 Dress up your next casino night fundraiser with Amerifun. We offer a well-seasoned production with premium equipment and high-quality chips with denominations. Provide your guests with the gaming that they expect, the chips they will appreciate and the dealers to help make your fantasy casino fundraiser an extraordinary experience. ...and Everyone is a Winner! While there can often be a shortage of funds, there is no shortage of charities struggling to meet the demand for assistance. Whether you are a social organization representative, or just someone who holds a soft spot in your heart for, or feels a connection to a particular charity or cause, congratulations on taking a look at a festive casino party as a way to raise funding dollars. A casino party fundraiser is at the top of ways to raise the most possible revenue. You give guests two things: a chance to lend a helping hand and a reason to have fun - at the same time. And when folks show up, they are coming to play! They can win big prizes as well as get that that warm feeling inside that comes from helping someone. Human beings have opened their hearts, and their wallets, to others who are less fortunate time and time again. If you are seeking donations and sponsors in advance of your fundraising event, consider offering potential contributors the opportunity to underwrite a particular aspect of the event (in addition to any opportunities that you may offer such as cash or merchandise donations) and put their name in print for all guests to see (in relation to the value of the donation) on t-shirts, flyers, mailers, banners or table signs. For example: Consider offering potential contributors the opportunity to sponsor a particular game in the casino and then place their name on the table limit sign. For the discerning client: We offer custom 'digital synthetic' professional gaming layouts, these are the newest thing in the gaming industry in over 50 years. Virtually any image can be "printed" on the cloth in any color. Offer large contributors a custom gaming table with their name for all playing that game to see and then they can keep it as a souvenir or offer as a prize! Custom tables typically start around $500 + cloth (from $200). 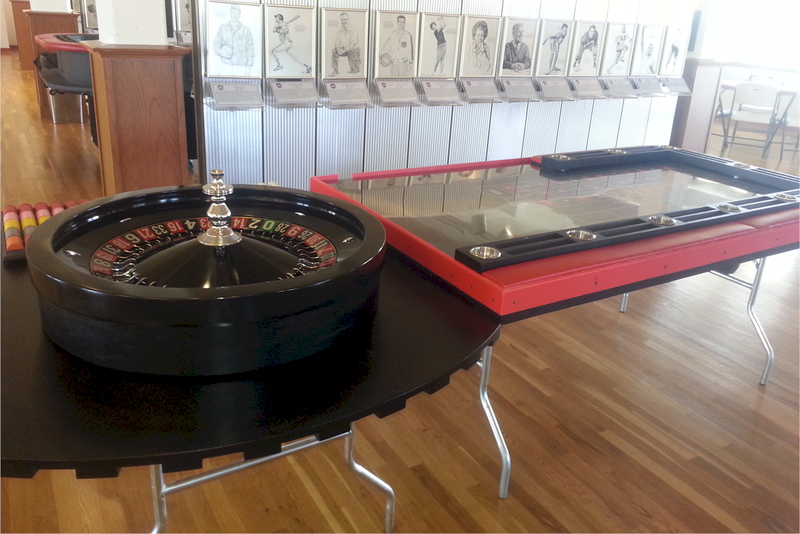 We also offer "gaming table rentals" for temporary use of your cloth for $75 (includes labor). For example: You may already be offering contributors opportunities to sponsor individual games in your casino... Consider offering them the chance to sponsor the staff. Sponsors could contribute the cost of the dealer ...or... Contribute the cost by being the dealer. Not only will this end your seach for volunteer dealers but it will save you on the cost of the casino game as well. You could also take this a step further and offer potential contributors the chance to contribute even more by underwriting the cost of the dealer AND being a dealer - this will raise even more funds for your cause while still giving the sponsor some excitement from the other side of the table. FREE PROMOTIONAL FLYER (a $50 value). With your input, we will design and create for you a free promotional flyer to help advertise your event. An attractive promotional flyer will create excitement among potential contributors. And be sure to hire a company with first-rate equipment - stylish equipment will increase attendance thus increasing revenue! BONUS: To make your campaign that much easier, we will provide you with a cop of your flyer pasted into your e-mailbox so that you can easily send it to potential contributors without having to attach a file. DONATION OPTIONS. TIP: Compile your guest list vigilantly. Are you wondering how much you should ask guests to donate? A good common amount is a $20 cash donation receives $1000 in fun money... or $100 receives $5000 in fun money (you could also offer $7,500 for that $100 cash). Please look over our newly updated Donation Options page where you can create your own donation schedule or we can help you choose the option that is best. TIP: Remember Minimum and Maximum Bets. Your table limits WILL INFLUENCE how often guests return to donate again. DONATION AMOUNT SIGNS. No need to worry about producing a chart to let guests know how much they can donate - we provide these for you at no charge! FREE FUN MONEY in black & white copies always included. If you would like to personalize your event, we can also provide you with black & white on colored paper or brilliant full color money in a variety of paper types, please see our Event Toolbox. And the money is yours to keep! ADDED SECURITY. Our authentic professional custom gaming cheques (chips) provide added security for your fundraiser in that there are no others like them in circulation anywhere. 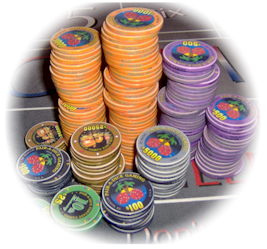 Our chips are not available in stores-we use only genuine Paulson and Chipco chips, the exclusive supplier to 100% of mainstream casinos. ALL OUR CHEQUES ALSO HAVE DENOMINATIONS ON THEM. CUSTOM HIGHER MINIMUM WAGERS and LOWER TABLE MAXIMUM WAGERS. 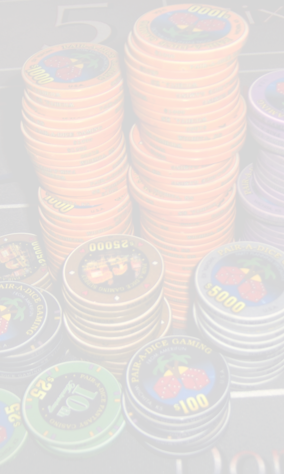 ADDITIONAL TIPS: We will drag a percentage of Poker Pots and pot games for house (same as casinos do). a higher minimum bet as well as a higher maximum bet. We recommend considering $25-$100 min. bets and "no limit" for max bets. ADDED REVENUE. Aside from stylish equipment, flexible table limits and many free extras, we instruct our dealers to rake from all pot games so that your organization can earn money from specific tables. In addition, we adhere to 'By-the-Book' odds and rules for your fundraiser with only the limited bonuses found in casinos. Also rely on Amerifun to recommend the right minimum and maximum bets. 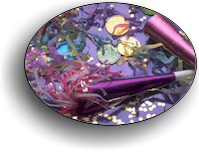 Free ON-SITE EVALUATION of your party facility and FREE FLOORPLAN. As always, we will work hand in hand on logistical issues with your facility contact- so you don't have to! GREAT ADVICE while planning your event every step of the way! EXPERIENCED EVENT PLANNING. Wash your hands of the workload! We can plan all or part of your next event. He or she must not be ridiculed. He or she must be given a reasonable amount of “play money”, in accordance with that of other guests, but not an excessive amount. Compile your guest list carefully. Your guests will be more quick to donate to a cause that they feel a personal connection to. Be careful of large public events that are mass marketed. The amount of funds raised may fluctuate. Figure how much you want to raise and how many people will attend. We have a simple formula to help you determine suggested donation amounts, choose from several options. If someone does not wish to donate, they must still be given equal opportunity to win any prizes. It is recommended that they receive a reasonable amount of “fun money”, proportionate to others at the event, for the duration of the party and be subject to no ridicule. We sincerely hope that your event will raise needed funds and we expect that it will. People love the thrill of winning, and seeing others win too. 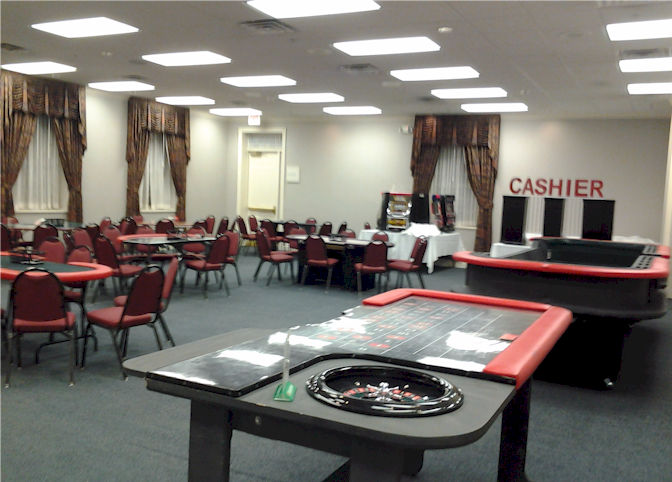 Call us anytime at (316) 821-0202 to book your Charity 'Fun-Raiser' CASINO PARTY! We can assign our Teller to distribute funds according to a procedure that you specify. Guests redeem their Chips and leftover fun money to their dealer or cashier for prize opportunities. P Look to Amerifun for theme props and decorations including flowers, balloons, party rentals, party supplies as well as additional services such as photographers or limousine rentals. P Re-confirm all your orders.